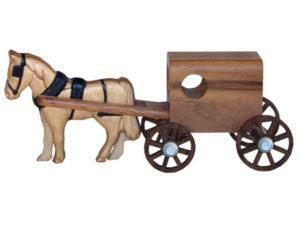 At 6 inches wide by 2 1/2 inches high, Miniature Amish Buggies make perfect play pieces for your little kids. Plus, they make cool wall hangings or attractive mantle displays. And they’re from Brandenberry, renown for top-quality Amish-made, solid hardwood furniture. This Mini Grey and Black Pennsylvania Buggy has a grey Amish horse and black buggy. Amish Horse and Buggy of Indiana. Amish Horse and Surrey Buggy of Ohio-Indiana. 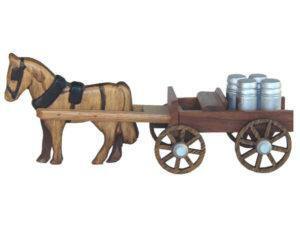 Amish Horse and Buggy with Milk Cans. Amish Horse and Buggy of Pennsylvania. Nothing represents the Amish lifestyle like the Amish buggy. And at Brandeberry Amish Furniture, we’re delighted to offer these iconic symbols of the ‘Plain people.’ You can choose from Pennsylvania, Ohio and Indiana buggies. So imagine displaying one on your mantle or wall. 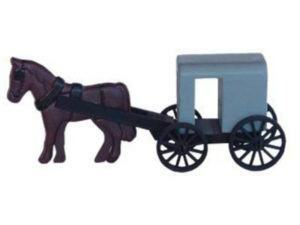 And think of how much a small child in your life would love having their own miniature Amish buggy. Also think of the teachable moments that can arise as you explain why people in 21st Century America decide to live by 18th Century norms. Skilled artisans painstaking carve each miniature piece from solid hardwood. Also, the artisans apply stains and/or paint plus a sleek finish. You can select a model as shown. Or, you can choose from a variety of options, including wood specie, stain and finish.